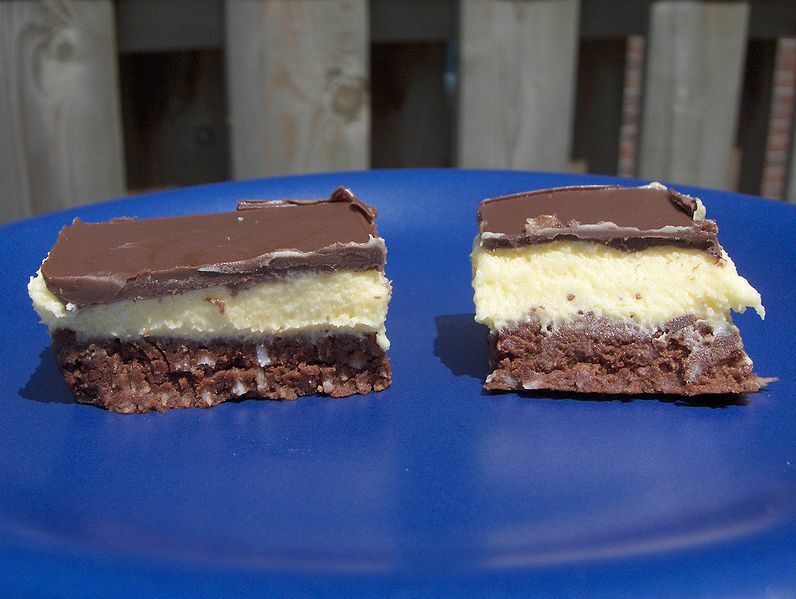 The Nanaimo bar is a dessert of Canadian origin popular across North America. A type of chocolate no-bake square, it is named after the West-Coast city of Nanaimo, British Columbia. It consists of a wafer crumb-based layer, topped by a layer of light vanilla or custard flavoured butter icing, which is covered in chocolate made from melted chocolate squares. Many varieties are possible by using different types of crumb, flavours of icing (e.g. mint, peanut butter), and types of chocolate. Two popular variations on the traditional Nanaimo bar involve mint flavoured icing or mocha flavoured icing.